Vintage Frames Company Dice N1 - Matte Black and Gold Need Help? With one of the largest vintage frame collections in the world, Corey Shapiro has long been considered at the top of sunglass aficionados’, and has been sought out by a bevy of who’s who celebrity clientele. Designing for and bringing back Cazal to its former glory, he has been a force in the sunglass game north of the border for the past decade. Now he brings forward his very own debut namesake collection, Vintage Frames Company by Corey Shapiro. 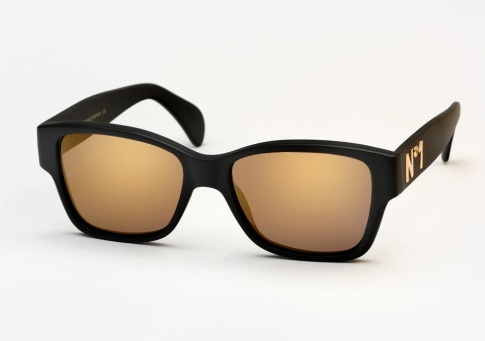 For all you that got trophies for coming in last place and were told you were the “last winner”, these sunglasses are most definitely NOT FOR YOU. There is only one number 1 ! The Dice is inspired by Andrew Dice Clay and classic low rider styling. It fuses a timeless shape with a brash "No.1" done in gold metal on the left temple, it is then finished off with matching gold mirrored lenses.